DXA (Dual-energy X-ray absorptiometry) is a means of measuring bone mineral density in the body. Two X-ray beams with different energy levels are aimed at the patient’s bones to determine the density of them. DXA scans are used primarily to evaluate bone mineral density and to diagnose osteoporosis. 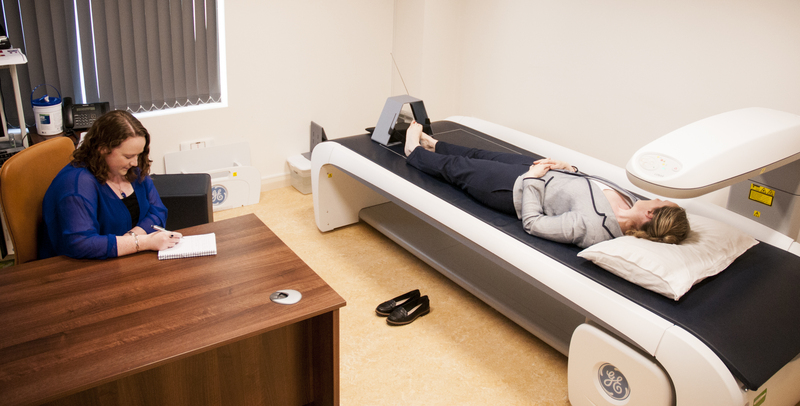 DXA scans can also be used to measure total body composition and fat content. Mayo Medical Centre is pleased to announce that it has commissioned the most modern DXA scanner in Europe. 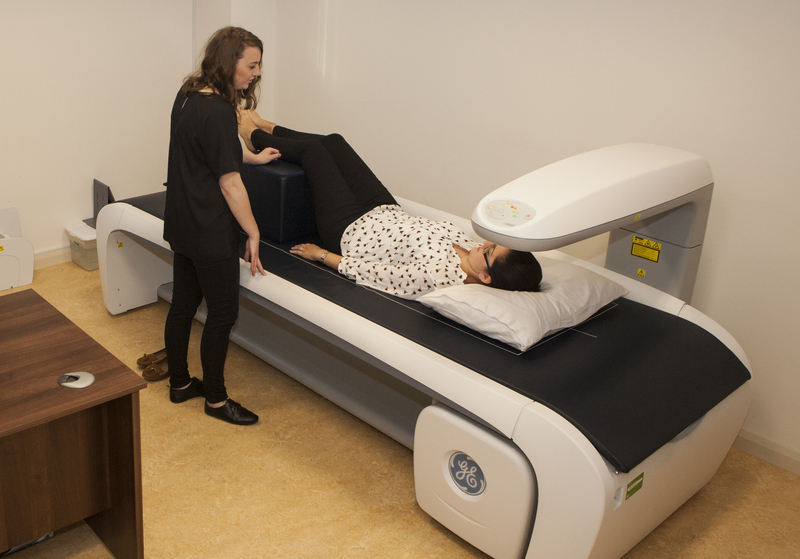 The new scanner allows a dramatic improvement in the reliability of DXA scanning and is capable of detecting changes in bone density to within an accuracy of 0.03%. 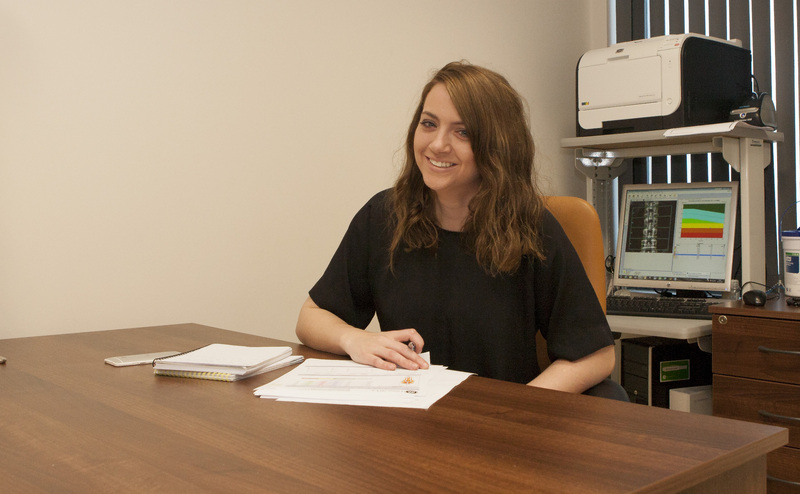 The new scanner allows a far shorter scan time with a significant reduction in radiation dose in comparison with other scanners. Osteoporosis is a silent disease that involves thinning and weakening of your bones which results in a tendency to fracture more easily than normal. Osteoporosis is the most common type of bone disease which affects approximately 200 million people worldwide. 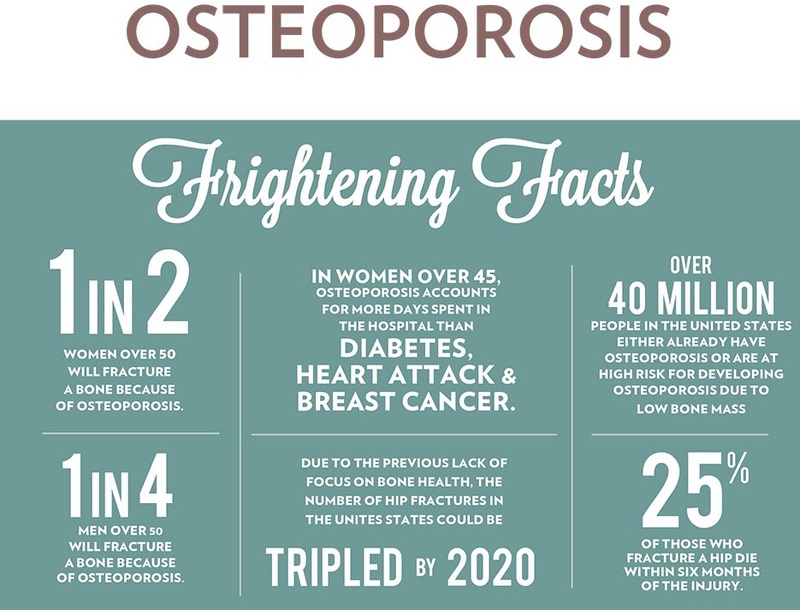 Osteoporosis affects 1 in 3 women and 1 in 5 men. The incidence increases to 1 in 2 women over 65 years of age. It is estimated that approximately 300,000 people in Ireland have Osteoporosis. Premature Menopause or missing periods. The hormone estrogen decreases sharply when women reach menopause, which can lead to an accelerated rate of bone loss with women losing up to 20% of their bone density in the 5-7 years after menopause. Who should have a scan? Women over 65 years of age and men over 70 years. Also post menopausal women under the age of 65, with risk factors and those who have had a fracture from a trip or fall from a standing height or less. Which areas do you scan and why? The areas scanned are the spine and hips as these are the highest risk areas for osteoporosis related fractures, followed by the wrist. In the case that a patient has artificial hip replacements we scan the wrist instead of the hips. About half of all women over the age of 50 will have a fracture of the hip, wrist or spine during their lifetime. Among those people who fracture a hip, 12-20% die within one year after the fracture and more than 50% of the survivors are unable to return to independent living. Don’t wait for a fracture as a formal diagnosis….get a DXA scan today! What if I have already had a scan a number of years ago, do I really need to get another one? It is very important to have a DXA scan every two years. It’s like getting your blood pressure checked you wouldn’t do it once in a lifetime. This is something that should be monitored every 2-3 years especially if you are on treatment as the scan is required to monitor the changes in bone density and how effective/ineffective your treatment is. What can I do to improve my bone density? The cost of a DXA bone density scan is €100 or €80 with a medical card. The cost of this scan is not currently directly covered by any insurance company. Medical card holders please bring valid medical card with you on the day of your scan. Please wear comfortable clothing without any metal objects such as buttons/zips if possible. Tracksuit bottoms, leggings or shorts or skirt with elasticated waist are recommended. Women will be asked to remove their bra on the day of the scan as clips and under-wires appear on the scan.